Below you will find a summary of just some of the many resorts and beaches that Corfu has to offer .. The village of Kondokali is located 6 km north of Corfu Town. From the village there are wonderful views over the Bay of Gouvia and the small island of Lazaretto just off the coast. During the Venetian occupation the ships that were suspected to carry disease on board were quarantined on this island, and during the Second World War executions were carried out here. In the distance you can see the mainland of Albania. Kondokali is located behind the main road and there are several bars, tavernas, shops and hotels. Small side streets lead to the pebble beaches. There is a regular bus service to Corfu Town. Adjoining Kontokali and at a distance of approximately 7 km north of Corfu town is the resort of Gouvia. Gouvia Marina supplies moorings for hundreds of boats and is the starting point for most sailing holidays. Although a small resort, there is a good selection of bars and restaurants. As it is in a natural cove the shingle/sand beaches are relatively small but you can hire sun loungers and umbrellas. Watersports are available in the summer months. Just a short walk from the beach are some Venetian ruins. The main road from Corfu Town to the North runs right through the middle of Dassia resort. Both sides of the road are lined with a good selection of restaurants, bars and shops and ATM machines. The long but quite narrow beach is a mixture of sand and pebbles and becomes more sandy the further north you go. A variation of watersports are available throughout the season – the beach immediately in front of the large hotels can become quite crowded in high season but it is usually possible to find a quiet spot at either side. Several side streets lead from the main road to the beach – a distance of approximately 100m so traffic noise is minimal. Gently sloping shores make it a good option for families. A regular bus service runs to Corfu Town. Ipsos is the next resort north of Dassia – the long narrow stretch of beach is literally right next to the road so perhaps not the best option if you are searching for tranquility but perfect if you would like to have a swim in clear waters only a few steps away from your car. A good selection of cafeterias, restaurants and shops are located on the other side of the road, although perhaps slightly commercial. In peak season this resort becomes very busy so at this time of year it is probably better suited to younger guests whereas earlier and later it is popular with older couples and families. There is a bus service to Corfu Town although not quite as regular as the service from Dassia. 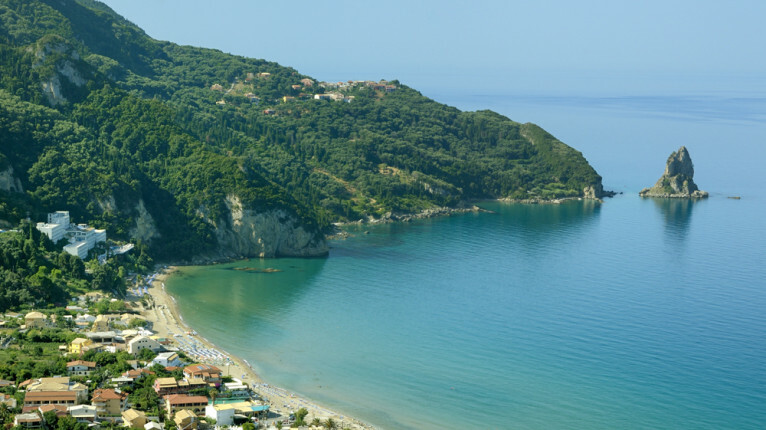 As we move up the north east coast Barbati is the next resort – a little more than 20km from Corfu Town. Backed by the huge Pantokrator Mountain it is a picturesque area. On the main road you will find a variety of restaurants and a few souvenir shops and mini markets. The beach itself is to be found by following the fairly steep side roads leading off the main road. Once down to sea level you will find a long sand/shingle beach with quite a few trees providing natural shade – in one part it is made up of large white pebbles and stones forming a stunning contrast to the deep blue sea. There are also a few restaurants down at the beach. A local bus service does connect to Corfu Town but is not so frequent. The next resort north of Barbati is Nissaki. The main road runs high above the beach so you need to drive or walk down the signposted small roads. Most of the shops and tavernas are up on the main road but there are a couple of restaurants down near the beach. Boat hire is available here. You will need to drive down the steep winding road from the main road to reach Kaminaki beach – mostly made up of small pebbles. There are a couple of tavernas here and a small coastal path allows you to walk to other small resorts such as Agni, Kalami and Kouloura. Despite the fact that the drive down from the main road is very steep and winding, this pretty little spot is very popular – it is approximately 600m below the level of the main road. A pebble beach which is perhaps not the best choice if you have young children with you as the water becomes deep quite suddenly. From the beach you can see Albania opposite and there are a couple of tavernas. A very small, quiet little bay with few facilities yet one of the most photographed spots on the island, the coast of Albania clearly visible from here is just a few kilometers away. A long, steep road leads down from the main road. Not to be confused with the resort of the same name on the north west coast, this little resort is the most northern of the east coast and is a couple of kilometres off the main road. The road down is steep and winding and can be a little intimidating the first time but if you drive carefully the wonderful views on the way down make it well worth it! With a small pebble beach and a few waterside restaurants it is a popular stopping point for people who have hired boats. Kassiopi was once a simple fishing village but is now a popular resort with a good selection of shops and eating places. At the harbour in the centre there is not a beach as such but a few small coves are just a short walk away. Traditional fishing boats still sail from here returning with their catch of the day. In an elevated position there are still ruins of an old castle which dates back to the 13th century. Right beside Kassiopi is the beach of Avlaki – a larger beach but with fewer facilities – just a couple of restaurants. Once a very quiet little resort, the fairly recent addition of a large hotel has brought more people here. It has a sandy beach and a second smaller beach can be reached on foot by following the path to the right. Close by is the Antinioti Lagoon. One of the largest resorts Acharavi boasts a very long beach – a mixture of shingle and sand. It has become a town in itself providing all services to the local people of surrounding areas, yet still maintains a holiday atmosphere. There are several roads leading off the main one to take you to the beach. There is a good variety of bars, restaurants and shops both up on the main road and also on the beach road. Supermarkets are mainly on the main road. There is a bus service to Corfu Town and this resort offers an excellent choice of accommodations. Moving slightly further North, Roda although much smaller than Acharavi, is more commercialized. It does however, have a good beach which slopes gently in the water making it suitable for families. There are remains of a Dorian temple here. A predominantly British resort, Sidari has a wonderful stretch of golden sand and gently sloping beaches. Popular with both couples and families there is a huge selection of restaurants, bars, and fast food. The northern part of the resort – Canal d’Amour has impressive rock formations and over time the sea has carved out a tunnel in the soft sandstone and there are several myths about swimming through it to find one’s true love. In surrounding areas there are several quieter small bays to be found. A smaller, more compact resort but still with a golden sandy beach and a selection of restaurants and shops it is a popular choice for windsurfers. The sandy/shingle beach runs parallel to the road but as only visitors to the resort use it there is very little disturbance from traffic noise. It has become increasingly popular over recent years but its authenticity remains and it has a selection of restaurants and small shops. On the North West coast this is a small resort with a great sandy beach, and a selection of restaurants and shops a good place, as all resorts on this side of the island to watch the sunset. Here there are several small beaches around the resort. Due to the formations of rock, sand and fauna in the sea there are wonderful contrasts of colour of the water from the deepest blue to the brightest green. High up on the hillside is a working monastery which can be visited and from the village of Lakones high above Paleokastritsa you can have a fantastic view of the resort below. Also nearby are the ancient ruins of Angelokastro. The resort has a good selection of restaurants and shops and is a good area for hiking. Small boats from the centre will take you to see the caves. 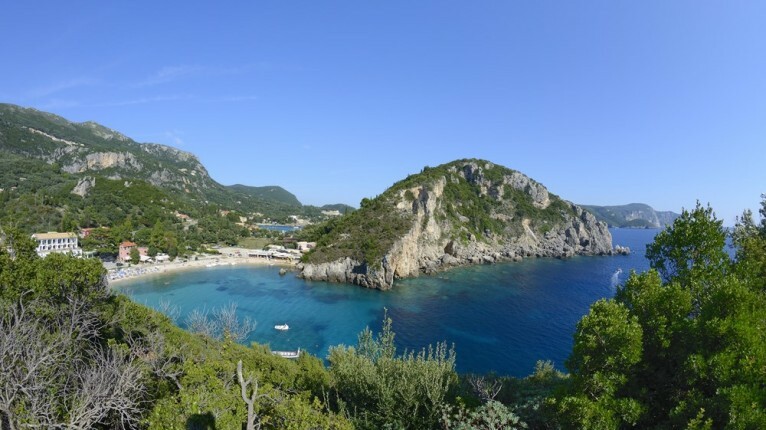 Just south of Paleokastritsa lies the small compact resort of Liapades. From the small sand/shingle beach it is possible to take a boat taxi to some beautiful beaches and coves that are accessible only by boat. Small donkey paths lead to two smaller beaches which can be reached on foot. 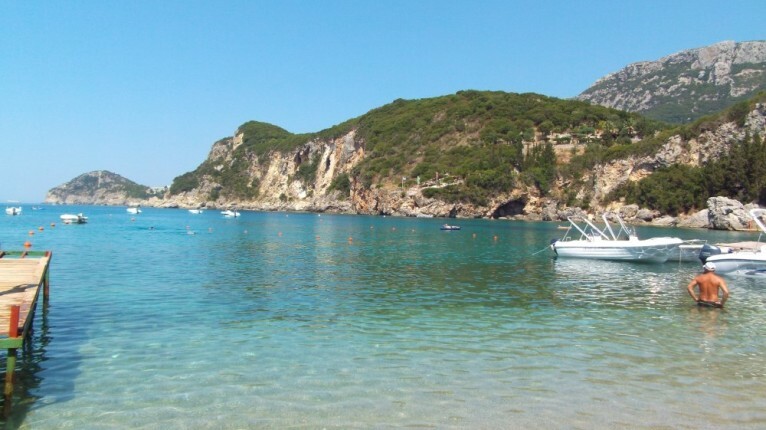 This is the closest resort to the Corfu Golf Course – a shingle/sandy beach with a few shops and restaurants. A wonderful sandy beach backed by lush green mountainside, albeit crowded in the high season. Although shallow at the shoreline the sea does become deep quite quickly. Reached from the village of Vatos this is the only official nudist beach on the island. A very steep drive down with only a couple of snack bars. Nearby is the Myrtiotissa Monastery. Pelekas is the name of the village and Kontogialo is the name of the beach. A lovely sandy beach which remains shallow for quite some distance makes this a popular choice for families with children. Although not many facilities down at the beach apart from some very good restaurants, the village has everything you need. Transport is probably recommended here as it is a very steep climb up to the village. Kaizers Throne in Pelekas is a magnificent view point allowing you to see for miles. A well organized resort with good facilities and a sandy beach. Watersports and a diving school are present here – do take not of the flag warnings though as there can be quite strong undercurrents. These two resorts are separated by the Messonghi river. Moraitika high street has a good selection of restaurants and bars and more tavernas can be found close to the beach which is reached easily by side roads from the main street. Beaches in both resorts are a mixture of sand and shingle. More restaurants and shops are to be found in Messonghi. There is a bus service to Corfu Town though not so frequent as the Benitses service. On the hillside behind Messonghi there are temple remains which date back to the 3rd century BC. Though neither of these villages boast particularly good beaches they are in an unspoiled area which has not been over developed. Both are famous for their fish restaurants and it is still possible to take a refreshing dip in clear waters whilst waiting for your fish to be grilled to perfection. These three resorts have wonderful stretches of golden sand, Santa Barbara being the smallest of the three. Agios Georgios was built pretty much with tourism in mind with its numerous hotels, restaurants and bars whereas Marathias remains a more traditional village. When heading towards the beach at Marathias take the right fork if you want peace and quiet, a short walk along the beach will guarantee you your own spot not matter what time of year. It is possible to walk the whole stretch of beach from one resort to another. 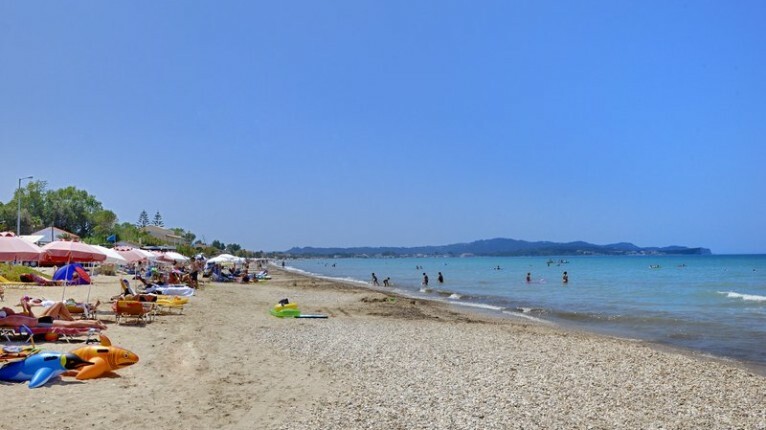 Although swimming in the lake is prohibited due to the fact that it is a nature reserve, nearby Issos beach, backed with huge sand dunes is a good option. There are limited facilities here but it is very popular with windsurfers. Gardenos has a fairly good stretch of sandy beach which is actually split by the small Gardenos river which runs into the sea at this point – the surrounding area is full of olive groves, vineyards and fruit trees. Vitalades also has a nice sandy beach with just a couple of cafeterias. Located way down on the southern tip of the island these days Kavos mainly caters for younger guests. Although still some good restaurants for eating out and a long sandy beach the resort is really geared for nightlife.